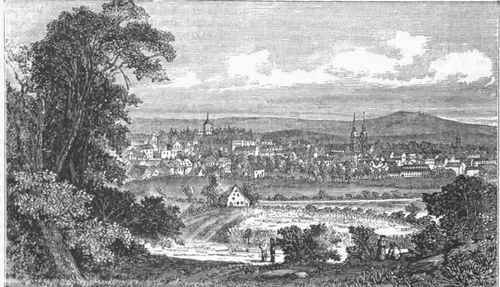 Baireuth, Or Bayreuth, a city of Bavaria, capital of the circle of Upper Franconia, on the left bank of the Red Main, about 50 m. by railway N. N. E. of Nuremberg; pop. in 1871, 17,837, chiefly Protestants. The town is well built and partly surrounded by ancient walls. It has a castle, riding school, gymnasium, theatre, public library, and public garden, an active trade, principally in grain, several breweries and distilleries, and manufactures of woollen and cotton fabrics, leather, and earthenware. There are three palaces in the vicinity. The Hermitage palace is a fanciful building, where Frederick the Great and his sister the margravine of Baireuth resided. Schwanthaler's bronze statue of Richter, who died and was buried here in 1825, is in the Gymnasiums-platz, and an inscription in gold letters marks his house in the Friedrichsstrasse. In front of the old castle, now used for government offices, is a monument in honor of Maximilian II. erected in 1860, and in the square in front of the new castle stands an equestrian statue of the margrave Christian Ernst. The corner stone of a great festival theatre, designed by Richard Wagner for the promotion of the German lyric drama, and especially for the performance of his own Nibelungen trilogy, was laid at Baireuth in 1872. - Baireuth was formerly the capital of the principality of the same name (previously of Kulmbach), the history of which was long associated with that of the principality of Anspach. Christian, a son of the elector John George of Brandenburg, who at the beginning of the 17th century succeeded as ruler of Baireuth, while his brother became prince of Anspach, removed the capital from Kulmbach to Baireuth. In 1763, on the death of the margrave Frederick, who had greatly promoted public prosperity, Baireuth and Anspach were united into one principality, and both ceded to Prussia in 1791. After passing under the power of the French in 1806, Baireuth was transferred to Bavaria in 1810.